UPDATE: Lessig weighs in on the reaction to Obama’s vote. Lessig is the man. His analysis of the possible reasons for this vote is very well stated. 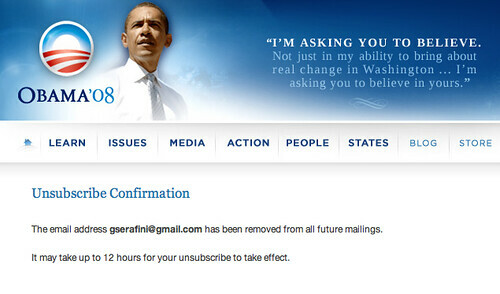 It doesn’t change my mind about unsubscribing from Obama’s email money train (for now). You know I love you. Your voice and message has given me actual real hope in a presidential candidate for basically the first time in my life. That’s why it pains me to unsubscribe from your mailing list today and suspend my ongoing giving of time and money to your campaign. On July 9, 2008 you used your power as a U.S. Senator to vote for giving telecoms retroactive immunity for actions that they KNEW were illegal. I’m just…baffled by your action on this issue. Perhaps you’re playing some kind of election chess or something. Maybe you have some masterful plan that you’re just waiting to execute. This was a pretty big disappointment for me, and many of my friends. Whatever your reasons, it comes across as being very uncharacteristic of your previous strong stances for freedom, the rule of law, accountability, etc. 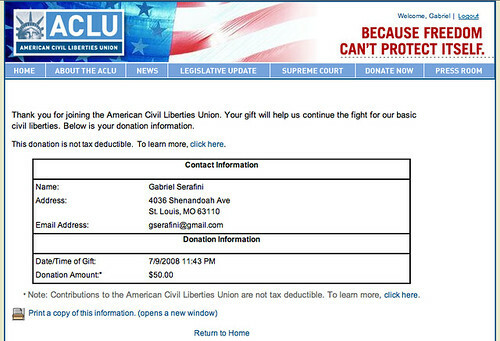 I want you to know that today I joined the ACLU and donated $50 to their efforts to defend American civil rights that I would have gladly given you instead. So far, I’ve contributed $700 of my own money to you to help you win, because I believed in you. That you were intelligent (finally! ), understood sensible and subtle approaches to policy, war, and other issues. Lately, however, with your seeming backsliding on a number of issues that you previously strongly stated support for, well, it’s been harder and harder for me to consider clicking the nice red Donate button that you include in each of your emails. I hope you win the election. I have zero desire to see McCain in the White House. Don’t be like Kerry, where in the end, it was like, oh well, guess he just wasn’t strong enough or good enough or tough enough to win it. Against Bush for God’s sake. Have fun at your ‘open’ convention in Denver. I still hope that you really do, in fact, mean all the things that you said when you were busy drumming up support by delivering your inspiring messages. You had me inspired. Now you have me disappointed, and wondering if you’re actually real, if you really and truly have the integrity you promised. Your well-developed brand of authentic leadership has just taken a major, major hit. Be the strong leader we want, that we need. Being strong means taking a principled stand, and not backing down, watering down, or standing down. I still want you to win. With your recent vote, however, I’ve been ‘inspired’ to take my own action, to go ahead and donate future contributions and time to other people and parties who have demonstrated their willingness to stand up against the errors of our day. Thanks for the ride. Good luck, and peace out. Cross-posted to the biggest group on Barack’s social networking site: SenatorObama-PleaseVoteAgainstFISA. Video of Olberman’s commentary on Barack’s opportunity to do the right thing on FISA, before the vote. It’s Tuesday, November 4th, 2008. Vote for Barack Obama today, vote for your future, vote. This entry was posted on Thursday, July 10th, 2008 at 1:26 am	and is filed under Politics. You can follow any responses to this entry through the RSS 2.0 feed. You can leave a response, or trackback from your own site. The FISA vote was… scary. Guns being confiscated by police in post-Katrina New Orleans scary. I’m glad the other shoe is finally hitting the floor with Obama. I have long wondered when it would. Glad it’s now so the punch people have been drinking can wear off in time for them to realize there are viable candidates outside of the Republicrats. The Donkeys and Elephants are the same beasts on the inside, they just choose to subvert your liberty with different means. Obama started showing his true colors with his pro-Israel speech; this FISA vote confirms his ‘politics-as-usual’ pedigree.